Mary Ann Palmer-Springs, a native of Bellville, graduated from Prairie View A&M University, Prairie View with her Ph. D. in Educational Leadership on August 11, 2011. Palmer is the daughter of the late Mr. and Mrs. Howard Palmer of Bellville and a 1987 graduate of Bellville High School. Upon graduation from Bellville High, Palmer enrolled at Prairie View A&M University majoring in music with a minor in drama and theater arts. 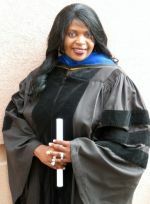 It was while at the university that Palmer honed her musical and dramatic skills that helped propelled her to the position of Miss Prairie View A&M University in 1989. As Miss PVAMU, Palmer competed in the Miss Texas Pageant (Miss America) and later on the Miss Hall of Fame Pageant where she was fourth runner-up. Never one to give up, Palmer entered and won the Miss Collegiate African American crown, a title that would take her on a global tour of the United States and Africa and parts of Europe in between. Palmer also got the opportunity to appear on the popular talent show Star Search and a chance to meet her musical hero, Mr.Charley Pride, where she presented him the Legends Award at the Black's in Music Award Program in Los Angeles. Palmer also performed with the likes Sinbad, Barry White and Cyndy Heron of EnVogue. Palmer received her Bachelor of Arts degree in Theater Arts in 1992 and the Masters of Education in 2006. She entered the field of education as a teacher, mentor and program director, all the while still pursuing her career in country music. In the meantime, Palmer decided to enroll in the doctoral program and thus earned her degree. Upon graduation, Palmer relocated to Athens, Ohio to support her husband, Michael, who was attending medical school at Ohio University. Tragedy struck the family in August 2011 with the multiple passing of her parents. To be near family, Mary and Michael moved back to Pearland, Texas, where she is teaching at the middle school level. Palmer has two albums to her credit: “Lookin’ at Mary Ann,” released in 1991 and ‘Mary Ann,” in 1993, both on UNITAN Records. Palmer plans on turning her dissertation, “Living Legacies: A Phenomenological Study of Four African American Male Educational Leaders at Southwestern Historically Black College and University,” into a stage production later in the year. She also plans to return to her first love of Country Music in full force and is currently recording in hopes of releasing another album soon. For information contact: blackcountrymusicassociation@yahoo.com or prairieviewtoday@iwon.com. Good for her and God bless, at least this was one door that wasn't closed to her, like country music seems to be. I hold that glass ceiling is shattered one day SOON, once and for all. So sad what they've done to black folks in that industry.